Yesterday we were lucky enough to attend the charity luncheon of the prestigious Lakeland Book of the Year awards at The Castle Green Hotel in Kendal. It is a location that I am familiar with as just over a year ago we held the book launch for The Wainwrights in Colour at this hotel. Recently I was informed that from the original submissions of over 50 books my work was in the final 15 shortlist. The books were on a huge variety of subjects but with one thing in common, they had to have a connection with Cumbria and mine certainly fitted into that bill. The awards were judged by a panel of three, Hunter Davies, Eric Robson and Fiona Armstrong so it was down to personal taste. After a fabulous three course lunch the audience of over 140 guests tuned in to the main prupose of th day, the awards. 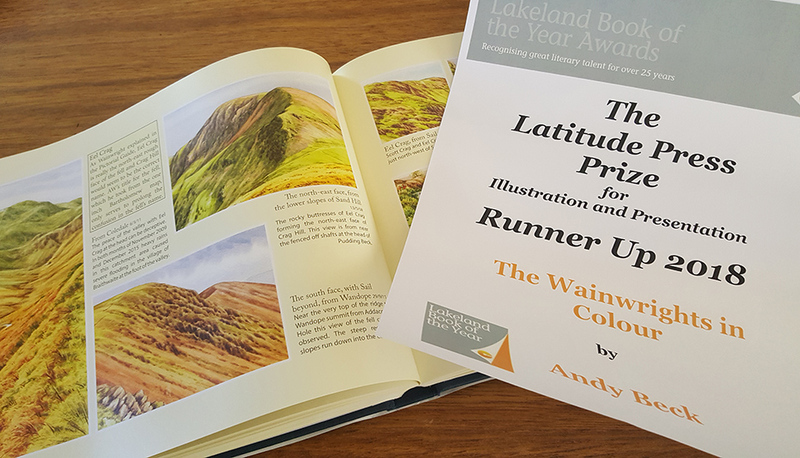 There were 5 categories and I was one of three in the running for the prize for Illustration and presentation, the others were James Bell, a wonderful photographer who, like me had self-funded and produced his own work- Capture Lakeland. The other shortlisted book in this category was Phil Rigby, the former Picture Editor at Cumbria Life magazine with his book- Portrait of Cumbria. Phil went on to win not only the category but also the overall prize of Lakeland Book of the Year. Well done Phil. As a runner up I freely admit I was slightly disappointed but hey ho, it isn’t as if I have just got a certifcate as runner up for my efforts. I am very lucky to have previously won awards for the book, both the TGO magazine “Outdoor book of the Year” award and the BBC Countryfile Magazine “Book of the Year” award hang proudly in my studio and I will have pleasure in framing up the new certificate which will hang proudly next to the others. It may be the last of the awards for me as I have done the rounds, maybe if there was a publisher behind me they would endeavour to enter the book into every contest under the sun but to be honest it is much more important to me to receive aclaim from those members of the public who have spent their hard earned cash on my book and then either taken time to leave a review on the website for all to read here. or by complimenting me at events, out on the fells or on social media. Only yesterday I had this comment on Facebook: “The more I look at your book, the more I think it will become a Lakeland classic and sought after for many years to come.” M.V. and that is just one of the many that I have had over the past year. Those are much more important to me than a piece of paper in a frame. Thank you all for your support and comments.